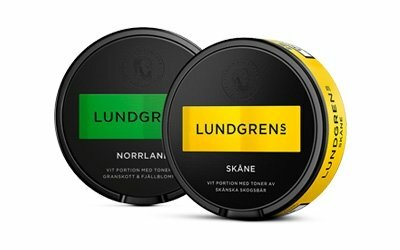 Lundgrens snus comes in a variety of flavours, styles and sizes. Along with original snus and white snus, Lundgrens also offer a prebaked loose snus that guarantees an enhanced flavour experience. Prebaked snus is a unique concept that allows the user to create portion sizes that suit individual preferences. Original and white snus are available in the normal large portion size and for those who prefer a less noticeable subtle snus there is also a slim option. The white snus portion is produced using organic leaves grown in Sweden and is a rich tobacco flavoured snus with the wonderful hint of wild berries; slightly drier than original snus and therefore a great non-drip option. Lundgrens is one of many brands by Fiedler and Lundgren but it is considered to be the premium brand from this company. There have been many exciting innovations introduced to this brand over the years helping to retain its popularity whilst improving it every step of the way. The flavours are constantly being tweaked to ever higher degrees of perfection, ensuring a wide range of blends that will suit a discerning clientele. The original Lundgrens flavour is a dark tobacco base with a sweetness that comes through with a floral note and herb undertone. The first innovation was the perforated bag. Snus usually comes in small premade pouches and the material that contains it is very important to the way the snus works. With the perforations, Lundgren snus is able to be absorbed faster into the lip ensuring a faster nicotine hit for the user. Lundgren also uses a larger bag of snus compared to competitors and this method holds the flavour better without allowing so much to flow out in one go. There is also a smoother finish on the outer layer of the pouch which allows the pouch to sit more snuggly and comfortably under the lip. The smoother material means that there is no chaffing on the more sensitive skin under the lip, which allows the user to keep the snus in place longer and to use it more often. The packaging is in the form of round tins adorned with the Lundgrens logo and the latest improvement to the packaging is the FlexLock. This is an innovative cover for the tin and is made of flexible rubber which allows the container to hold used pouches, and it stretches to accommodate the amount of portions used. With so many improvements and continuous updates, sublime flavours and great nicotine hits, it is unsurprising that this snus remains a favourite. Lundgrens is manufactured by the company Fiedler and Lundgren. Fiedler and Lundgren is the second largest snus company in Sweden and in addition to this is also one of the oldest. In 1915 Fiedler & Lundgren, in opposition to the Swedish government of the day, moved their production to Denmark. 88 years later, in 2002, Fiedler & Lundgren moved back to Sweden and their roots. With strict self-imposed standards of product quality, it is no surprise that Fiedler and Lundgren have established itself as a front-runner in the Swedish Snus industry. Now Fiedler and Lundgren employ nearly one hundred workers and can manufacture 22 tonnes of snus in a single year. Currently Fiedler and Lundgren enjoy huge success not just in Sweden but throughout Europe as well. This success is due in part to their aforementioned stringent standards. The idea of the brand is to offer clients a pure yet strong tasting snus harking back to the traditional Swedish snus of old. They offer many recognisable brands each with their own unique blend of tobaccos catering to a wide range of customers. Using nothing but the best tobacco leaf and carefully monitoring and measuring the amount of essential oils used in their products, Fiedler and Lundgren ensure a high quality product and one that doesn’t degenerate over time. Consistency and quality remain key parts of the business’s work ethic.